Antonio Nieves is an associate attorney in the South Florida area who joined the firm in 2017. Mr. Nieves focuses on personal injury and first party claims. Originally from Caracas Venezuela and the son of a judge, he took interest in the law at an early age. He graduated with his Bachelor's Degree from Florida Atlantic University and later attended law school at Nova Southeastern University Shepard Broad School of Law. 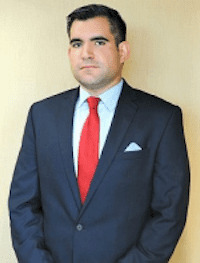 Prior to joining the firm, Mr. Nieves has litigated and gained extensive experience in matters involving motor vehicle accidents and premises liability with firms in Boca Raton and West Palm Beach, Florida. He is passionate and aggressive about fighting for his client's rights and getting them fair compensation for their injuries. Mr. Nieves is also fluent in Spanish and was an Associate Editor of the bilingual law Journal of his law school. Being a new father, he enjoys spending time and travelling with his wife and son. He also enjoys golf, soccer, football and the Florida outdoors.